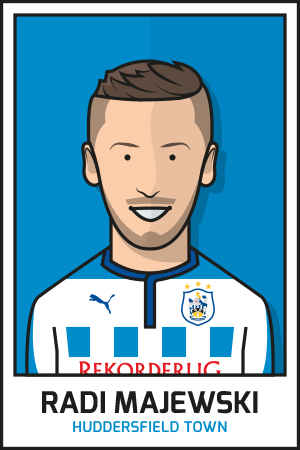 This all started with a random cartoon style image I started to draw of Nahki Wells whilst I was waiting for a client to get back to me on another project. I really liked the bold outlines of the illustration and about a week later I'd gone and drawn the majority of the Town squad for the 2014-15 season in the same style. It got me thinking that they'd make a great little set for a sticker book, an idea that would actually be great to have included in the official match day programmes, or magazines as they seem to be known these days. Imagine if you got a nice little album to put them all in with your first edition and then within each copy for the rest of the season you got, say 2-4, stickers to stick inside your album. Could work as a nice little incentive to keep buying them as folk, especially kids, will want to complete the whole set. When I was younger the programmes always used to have posters inside but I hated having to take the book apart and remove the staples in order to get to it but this has a nice keep sake without doing any damage to your purchased magazine. Anyway, these are my designs for the 2014/15 squad, enjoy! Mock up of how the stickers could look with different colours to label the positions of the player.